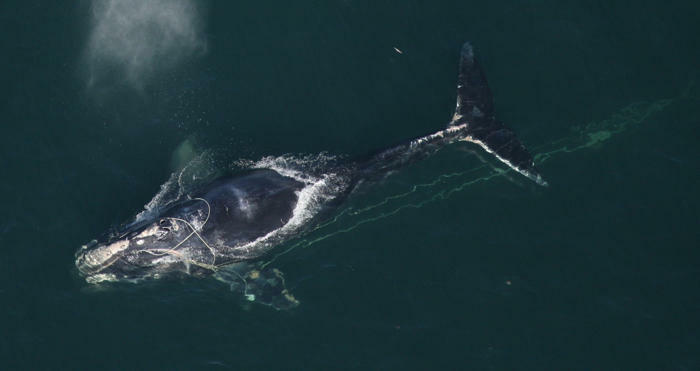 A North Atlantic right whale is freed from an entanglement with fishing gear off the coast of Florida in 2010. The Trump administration has approved a first step toward offshore oil and gas drilling on the Atlantic coast. Michael Jasny is an ocean noise pollution lawyer who directs the marine mammal protection project at the Natural Resources Defense Council. He says despite some restrictions included in the permits, they’ll still threaten endangered species like the North Atlantic right whale. The whales’ declining population recently dropped below 500 worldwide. They migrate south from New England to have their babies. Jasny says seismic pulses can travel long distances, confusing the whales and drowning out their calls to their calves, which may die if they become separated from their mothers. “Unfortunately, much of the right whales' habitat is right in the crosshairs of the seismic blasting that's been authorized today,” Jasny says. Another nonprofit, Oceana, says they'll track the seismic testing, which could take place any time over the next year over a large area. Environmental groups see the seismic surveys as a clear precursor to future Atlantic drilling activity – which residents and political leaders from almost every east coast state, including New Hampshire, have opposed. “More than right whales, today's decision is about our coastal economies, the sustainability of our fisheries, the health of our oceans,” Jasny says. Federal officials say the permits are limited to the mid- and southern Atlantic because that’s where companies applied to conduct seismic exploration. It leaves open the possibility of future seismic testing in the North Atlantic, as well as other drilling activity across the region. The new permits come over the objections of New Hampshire U.S. Sen. Jeanne Shaheen, who is co-sponsoring a bill that would ban such surveys in the Atlantic. The Bureau of Ocean Energy Management would have to approve any further oil and gas exploration in the Atlantic. It estimates the Atlantic continental shelf holds about 3 percent of the nation's economically viable oil and gas reserves, though the region has never had commercial fossil fuel discoveries or drilling leases. New Hampshire residents got some face time Monday with the federal staff behind a proposal to expand offshore drilling in the North Atlantic and elsewhere. A couple dozen protesters and environmental advocates waved anti-drilling signs at passing cars outside a Concord hotel during the information session. A public hearing earlier this week attracted environmentalists, fishing groups, and many others who oppose President Trump's new proposal to expand offshore drilling in the Atlantic, including off the coast of Maine and New Hampshire. We talk with NHPR's energy and environmental reporter Annie Ropeik about the latest developments and what impact offshore drilling might have for the state.